This lesson is about cells of immune system. It talks briefly abut morphology, diameter, number and role of immune cells associated with documents showing each cell type. 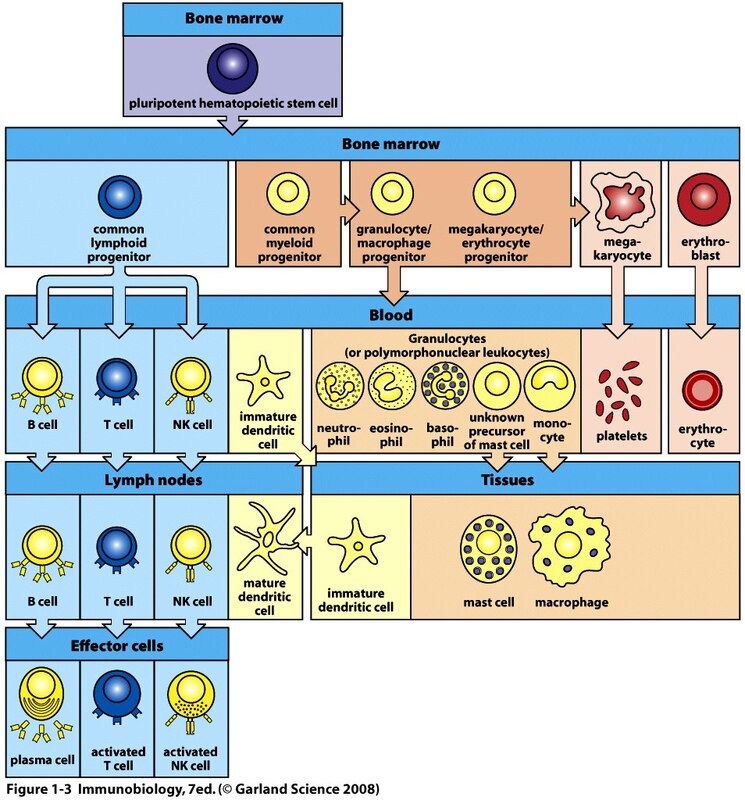 The immune cells that are involved in both innate (direct and non-specific) and adaptive (specific) immunity are the white blood cells or leukocytes. All white blood cells originate in the bone marrow and many of them mature there. All the cellular elements of blood are derived from the pluripotent hematopoietic stem cells. These elements include: erythrocytes, platelets and all white blood cells. They give rise to more limited developmental potential cells which are the common progenitors of the red blood cells and platelets and the 2 main categories of white blood cells that are the myeloid and lymphoid stem cells. 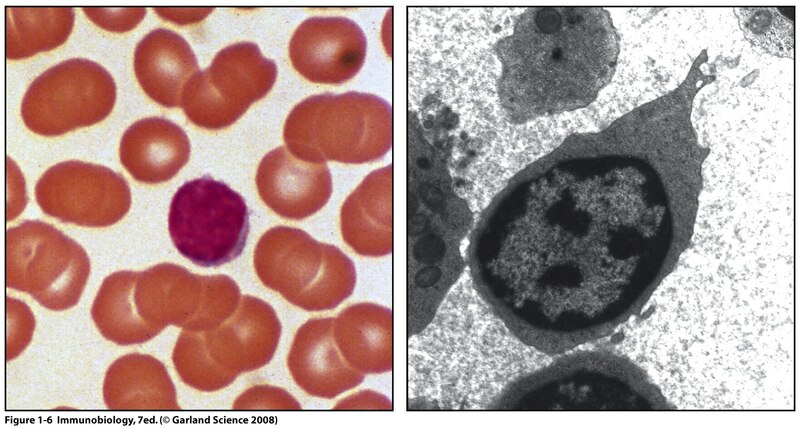 The common myeloid progenitor is the precursor of the Monocytes (macrophages), granulocytes, mast cells. These are the cells of the innate immune response. They are long-lived cells of 10-18µm diameter. They have phagocytic role and important in the first line defense in innate immunity. They possess a horse-shoe shaped nucleus. They form 6% of all leukocytes. Monocytes are usually found in blood stream, but when they migrate to tissues they differentiate and become macrophages. Macrophages engulf and digest cellular debris, foreign substances, microbes, cancer cells, and anything else that does not have the types of proteins specific to healthy body cells on its surface in a process called phagocytosis. Macrophages are antigen-presenting cells. They can display antigen of ingested microbe on MHC-II. They are called so since they possess density-staining granules in the cytoplasm. They represent 67% of all leukocytes. They are of 10-12µm diameter. They are also called polymorphonucleus leukocytes because of their odd-shaped nuclei. Eosinophil (attack large parasites, modulate allergic inflammatory reactions). They possess a round nucleus. They differentiate in tissues. They possess a cytoplasm rich in granules that contain HISTAMINE. They play an important role in allergic responses since they release histamine when activated. They are present in connective tissues and mucosa. The common lymphoid progenitor is the precursor of both B-lymphocytes and T-lymphocytes. These are the antigen-specific immune cells of the adaptive immune system. Both lymphocytes have a round, large nucleus occupying the cytoplasm. They represent 25% of all immune cells. They possess a 7-8µm diameter. They possess an antigen receptor called the B-cell receptor BCR having the shape of an antibody. When the BCR binds to its specific foreign antigen, it will proliferate and differentiate into plasma cell able to secrete free antibodies in the serum having same shape similar to BCR. Free soluble antibodies are also called immunoglobins (Ig). BCR is called membrane immunoglobins or surface immunoglobins. They possess a specific type of membrane receptor for other cell antigens called T cell receptor or TCR. These cells kill other body cells infected with virus or intracellular pathogens. They can also kill modified self cells such as tumor cells. They express a molecule called CD8 on their surface and so called T8 cell. It is a killer cell. Provide essential signals that activate the antigen-stimulated B cells to differentiate and secrete antibodies. Provide essential signals to activate Cytotoxic T-cells to kill infected cells. They express a molecule called CD4 on their surface and so called T4 cells. Suppress the activity of other lymphocytes and help control immune responses.